← May 6, 1865: Sherman advises against enfranchising black men. 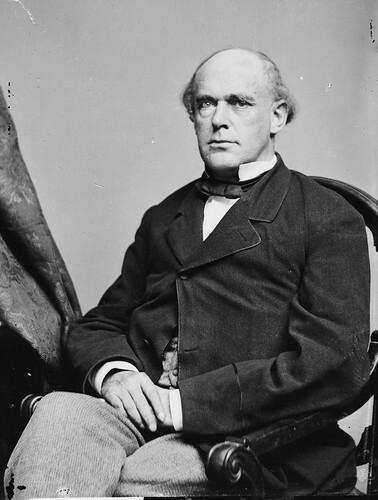 Chief Justice Salmon Chase wrote to Lincoln before his assassination advocating enfranchising freed slaves. Afterward, he had the letters printed up for distribution, and he sent copies to Sherman (see response yesterday), and to Schofield. U. S. STEAMER WAYANDA, Beaufort Harbor, May 7, 1865. DEAR GENERAL; Major-General Sherman has shown me your telegram to him,* on the subject of the reorganization and government of North Carolina, and it has occurred to me that you might like to know the general views of those who think as I do. I cannot, perhaps, put them before you with so little trouble, or more distinctly, than by sending you copies of two letters written by me to President Lincoln, just before he was so foully murdered. Some fifty copies were printed for the information of individuals-not for publication. I have, since his accession had several conversations with President Johnson, and think myself authorized to say that he desires the earliest possible loyal reorganization of the late insurgent States. He thinks that this reorganization should be the work of the people themselves, acting in their original sovereign capacity, and would be willing to aid their action in any proper way, as, for example, by the enrollment of all the loyal citizens, preparatory to the election of delegates to a convention. in this enrollment he would prefer that the old constitutional rule in North Carolina which recognized all freemen as voters, should be followed, rather than the rule the new constitution, which excludes all freemen of color. I think he is clear and settled in the opinion that no civil authority should be recognized which has its source in rebel election or appointment. It may be that he has already issued an address or proclamation stating his views. He was considering the subject when I left Washington, on the 1st instant. If no such document has appeared the information I now give may be useful to you. Permit me to suggest that you may find conference with General Cox on this class of subjects useful. I have known him well as a civilian, and have the highest opinion of his ability and judgment. Excuse me if you think anything I have written intrusive or superfluous. I write only in the hope of being of some service to you, and from interest in the important work of reorganization. MY DEAR SIR: When all mankind are congratulating you, one voice, heard or not, is of little account; but I add mine. I am very anxious about the future and most about the principles which are to govern reconstruction; for as these principles are sound or unsound, so will be the work and its results. You have no time to read a long letter, nor have I time to write one; so I will be brief. And first as to Virginia. By the action of every branch of the Government we are committed to the recognition and maintenance of the State organization of which Governor Pierpoint is the head. You know all the facts, and recapitulation would be useless. There will be a pressure for the recognition of the rebel organization on condition of profession of loyalty. It will be far easier and wiser, in my judgment, to stand by the loyal organization already recognized. And next as to the other rebel States. The easiest and safest way seems to me to be the enrollment of the loyal citizens without regard to complexion, and encouragement and support to them in the reorganization of State governments under constitutions securing suffrage to all citizens of proper age and unconvicted of crime. This you know has long been my opinion. It is confirmed by observation more and more. This way is recommended by its simplicity, facility, and above all, justice. It will be hereafter counted equally a crime and a folly if the colored loyalists of the rebel States are left to the control of restored rebels, not likely in that case to be either wise or just until taught both wisdom and justice by new calamities. The application of this principle to Louisiana is made somewhat difficult by the organization which has already taken place; but happily the constitution authorizes the legislature to extend the right of suffrage, and it is not to be doubted that on a suggestion from the national authorities that its extension to colored citizens on equal terms with white citizens is believed to be essential to the future tranquility of the country as well as just in itself, the legislature will promptly act in the desired direction. What reaches me of the condition of things in Louisiana impresses me strongly with the belief that this extension will be of the greatest benefit to the whole population. The same result can be secured in Arkansas by an amendment of the State constitution or what would be better, I think, by a new convention, the members of which should be elected by the loyal citizens, without distinction of color. To all the other States the general principle may be easily applied. I most respectfully but most earnestly commend these matters to your attention. God gives you a great place and a great opportunity. May He guide you in the use of them. I noticed this morning your proclamation closing the ports, and was glad to see it. I presume the law of forfeiture was well considered, and also the effect on against foreign vessels. MY DEAR SIR: The American of this morning contains your speech of last evening. Seeing that you say something on the subject of my letter to you yesterday-reconstruction-and refer, though without naming me, to the suggestions I made in relation to the amnesty proclamation, when you brought it before the heads of Departments, I will add some observations to what I have already written. I recollect the suggestions you mention; my impression is that they were in writing. There was another which you do not mention, and which I think was not in writing. It is distinct in my memory, though doubtless forgotten by you. It was an objection to the restriction of participation in reorganization to persons having the qualifications of voters under the laws in force just before rebellion. Ever since questions of reconstruction have been talked about it has been my opinion that colored loyalists ought to be allowed to participate in it, and it was because of this opinion that I was anxious to have this question left open. I did not, however, say much about the restriction. I was the only one who expressed a wish for its omission, and did not desire to seem pertinacious. You will remember, doubtless, that the first order ever issued for enrollment, with a view to reconstruction, went to General Shepley, and directed the enrollment of all loyal citizens, and I suppose that since the opinion of Attorney-General Bates, no one connected with yor administartion has questioned the citizenship of free colored men more than that of free white men. The restriction in the amnesty proclamation operated as a revocation of the order to General Shepley; but as I understood you not to be wedded to any particular plan of reconstruction, I hoped that reflection and observation would satisfy you that the restriction should not be adhered to. I fully sympathized with your desire for the restoration of the Union by the change of rebel slave States into Union free States, and was willing, if I could not get exactly the plan I thought best, to take the plan you thought best and trust to the future for modifications. I welcomed, therefore, with joy the prospect of good results from co-operation of General Banks with the free State men of Louisiana. I think General Banks’ error, and I have said so to him, was in not acting through, instead of over, the free State committee. This committee had already shown itself disposed to a degree of liberality toward the colored people quite remarkable at that time. They had admitted delegates from the creole colored population into their free State convention and evinced a readiness to admit intelligent colored citizens of that class to the right of suffrage. I have no doubt that great and satisfactory progress would have been made in the same direction had not the work been taken out of their hands. An impression was created that the advocates of general suffrage were to be treated with disfavor by the representatives of the Government, and discouragement and discontent were the natural consequences. For one I was glad of all the good that was done, and naturally wanted more. So when I came to Washington last winter I saw General Banks, and being more deeply than ever persuaded of the necessity of universal suffrage, begged him to write himself, and to induce the Senators and Representatives-elect from Louisiana to write to members of the legislature and urge them to exercise their power under the constitution by passing an act extending suffrage to colored citizens. I knew that many of our best men, in and out of Congress, had become convinced of the impolity and injustice of allowing representatives to States which had been in rebellion and were not yet prepared to concede political rights to all loyal citizens. They felt that if such representation should be allowed, and such States reinstated in all their former rights as loyal members of the Union, the colored loyalists of the States restored would be practically abandoned to the disposition of the white population with every probability against them, and they felt that this was equally unjust and dangerous. I shared these sentiments and was, therefore, extremely desirous that General Banks should take the action I urged upon him. I thought, indeed, that he concurred mainly in my views, and would, to some extent at least, act upon them. I must have been mistaken, for I never heard that he did anything in that direction. I know you attach much importance to the admission of Louisiana, or rather to her right to representation in Congress, as a loyal State of the Union. If I am not misinformed, there is nothing in the way except the indisposition of her legislature to give satisfactory proof of loyalty by a sufficient guarantee of safety and justice to colored citizens, through the extension to loyal colored men of the right of suffrage. Why not, then, as almost every loyal man concurs with you as to the desirableness of that recognition, take the shortest road to it, by causing every proper representation to be made to the Louisiana Legislature of the importance of such extension? I most earnestly wish you could have read the New Orleans papers for the past few months. Your duties have not allowed it. I have read them a good deal, quite enough to be certain that if you had read what I have, your feelings of humanity and justice would not let you rest till all loyalists are made equal in the right of self-protection by suffrage. Once I should have been, if not satisfied partially, at least, contended with suffrage for the intelligent and for those who have been soldiers; now I am convinced that universal suffrage is demanded by sound policy and impartial justice. I have written too much already, and will not trouble you with my reasons for these conclusions. I shall return to Washington in a day or two, and perhaps it will not be disagreeable to you to have the whole subject talked over. This entry was posted in Abraham Lincoln, Franchise, J.M. Schofield, Reconstruction, Salmon P. Chase. Bookmark the permalink.